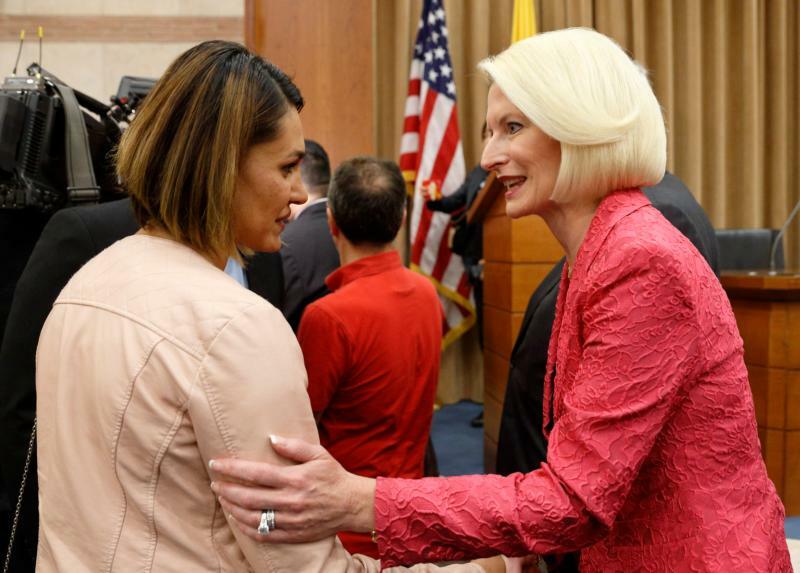 ROME (CNS) — Promoting and protecting religious freedom is a shared priority of the United States and the Vatican, said Callista Gingrich, U.S. ambassador to the Holy See. “Together we will continue to defend and support those persecuted for professing their faith,” she said June 25. The ambassador was one of several speakers at the symposium, “Defending International Religious Freedom: Partnership and Action,” sponsored by the embassy, Aid to the Church in Need and the Rome-based Community of Sant’Egidio. The one-day event was a forerunner to the “Ministerial to Advance Religious Freedom,” to be hosted by U.S. Secretary of State Mike Pompeo in Washington July 25-26. The D.C. meeting was to gather governments, religious groups and others to find concrete ways to rein in religious persecution and promote religious freedom. Gingrich said, “It’s a dangerous time to be a person of faith,” given the reports of increasing violence, discrimination and persecution against people of all faiths around the world. “We can and we must do more,” she said. Cardinal Leonardo Sandri, prefect of the Vatican’s Congregation for Eastern Churches, said the key to establishing true equality and mutual respect in the Middle East is in the concept of “citizenship” as the basis for social cohesion rather than religious or ethnic affiliation. All Christians in the Middle East “love their country, they feel a bond, and they want to serve” their nation, he said. They do not want to feel like “guests or foreigners” or second-class citizens, but as full-fledged citizens with equal rights and access to employment and opportunities, he said. A number of measures are needed to do remove outright and more subtle forms of discrimination, including having proper, benign reasons for registering people’s religious affiliation, he said. “Only in this way can all members of society — Christians and non-Christians — be authentically free, that finally they can no longer feel constrained to align themselves more or less overtly to the person who is in power at the time in order to see their own survival guaranteed,” he said. Creating segregated, protected zones for Christians in Iraq, for example, is not the answer, he said, but it could be the first step on a path of stable coexistence and harmony based on shared citizenship. Cardinal-designate Joseph Coutts of Karachi, Pakistan, told reporters at the symposium that the solution is to “not close ourselves in our circle of belief” and condemn others, but to come together recognizing, respecting and appreciating each other’s diversity. “Harmony is not the same as unity” in the sense of conforming or losing one’s own identity, but it is about sticking to own’s identity and sharing those gifts toward a common goal, he said. Cardinal Pietro Parolin, Vatican secretary of state, told the symposium the Catholic Church encourages everyone to raise awareness about the importance of full religious freedom and how governments, religious leaders, nongovernmental organizations and communities need to cooperate in order to achieve this. Promoting religious freedom is not about giving preference or privileged to one side or another, but is the simple “recognition of the equal dignity of every human person,” he said. “The Holy See does not tire of intervening” in calling for the respect and recognition of the rights of all religious and ethnic groups, particularly those who are suffering the most, he said.